"Nothing lasts" seems to be a worthy belief to reject. By reminding us of our own mortality the statement is a stark reminder that we are not in control. Instead we seem to be in a stream, and worse, yet, we appear to be governed by forces over which we have no control. Thus for several hundred years many people have chosen to ignore the obvious, we live at the sufferance of something else, something bigger, something incomprehensible." any system can be understood only by applying the concept of feedback. The amount of available energy can neither be increased nor decreased. Every conversion of energy from one form to another waste hear steadily increases. Eventually all energy will be converted into unrecoverable heat. Is a limit to our activity the amount of energy we generate? "Because energy is needed to support all life, population problems are inextricably tied in with the properties of energy." "Science is not about words, but it must be explained with words–which are never wholly satisfactory." What is the relation among, force, power and energy? 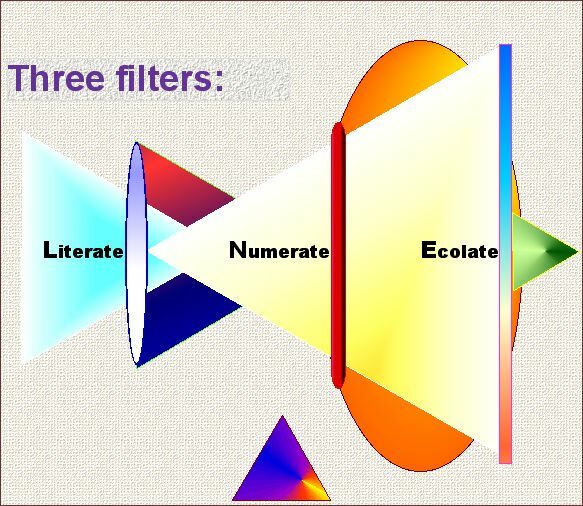 The Threefold Way: literacy, numeracy, & ecolacy. Literate -- can you read intelligently? Numerate -- can you count accurately? Ecolate-- can you act appropriately? An ecolate approach to regional planning, health or justice. Ecolacy as practicing adaptive management. Ecolate approach to problem solving for social justice. Culture is defined two ways: literal & figurative? The totality of human creations vs. the best we create. 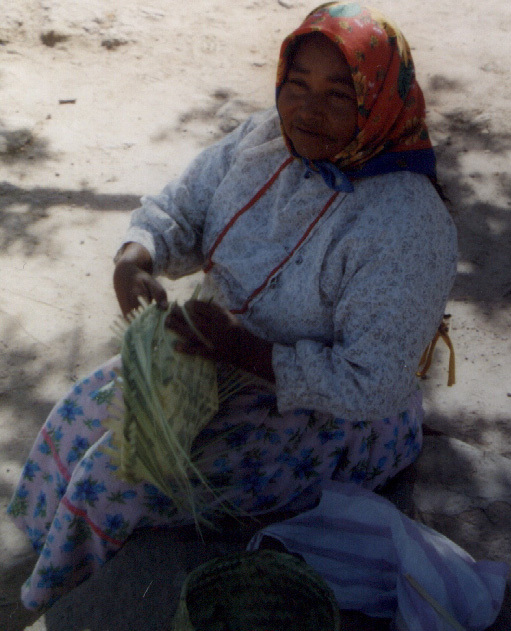 From simple plant materials the American woman weaves a basket that holds the materials needed for her life. The folly of mistaking material for mental progress is widespread. 1) Waste is a mental construct, not an objective reality. 2) Objectively speaking, there are no side effects. 3) There is no away to throw to. 4) All so called pesticides are, in reality, biocides, substances that kill life. Interventions always need to be audited & evaluated with three filters. Organisms: a fantastically complicated system of cells, tissues, organs. . . .
Systems of organisms: our well being depends on the survival in good health of many other kinds of plants, animals, and microorganisms. Garrett Hardin, Filters Against Folly, How to Survive..,New York: Penguin Books, 1987. A. N. Whitehead has said, Seek simplicity; and distrust it. It is difficult to imagine a more fruitful guide for scientific research. To see anything at all, we must abstract a few elements from the infinite totality; but when we do, we undoubtedly warp the truth. Therefore we must secondly -- and it must be secondly, and not at first, -- we must secondly turn a suspicious eye on the simplicity we have found and see in what way it is false to the facts. 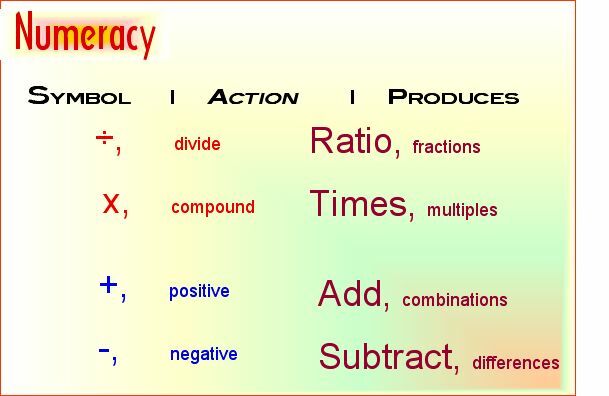 Numeracy, the ability to understand and work with numbers; for example ratios, percentages, and rates of change. In living creatures any increases in the surface area occur as a square of the cubic increases in the volume of the organism. No tree grows to the sky. How do we measure the forces we see around us? power is the amount of force acting against opposition (friction or impedance). energy is the capacity or ability to do work, create an outcome. Strong nuclear force gives rise to fusion, the power of the stars, like our sun. Nuclear decay, fission or the "weak force" that gives rise to radiation and electromagnetism. Gravity or gravitational attraction which is the latent force of mass, matter's capacity to warp space and curve the universe. The gravitational attractions acting across ever larger distances holding the cosmos together. Last Updated on 1-8-2010 after 12/20/2004.